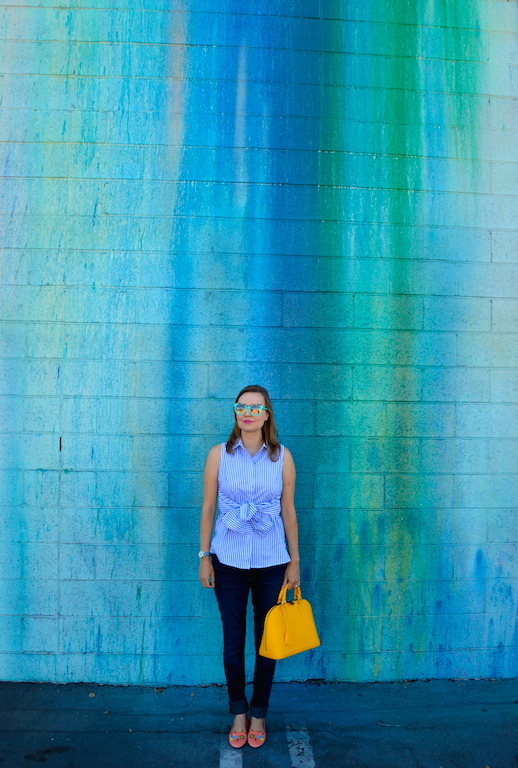 As you know, I love a good wall and this one in Pasadena is definitely one of my favorites. It's quite expansive and has just about every color imaginable in it, so no matter what you're wearing , you'll find a portion of the wall that matches your ensemble just perfectly! I discovered this wall last winter and it was sort of a little known gem tucked away behind an art school in the city. Now it seems as if the wall has really caught on because when my husband and I arrived there was a trio of ladies taking multiple photos of each other in front of its rainbow-laden splendor. Could this become the next Paul Smith wall? Who knows? In addition to a good wall, I also love a good fitted shirt. 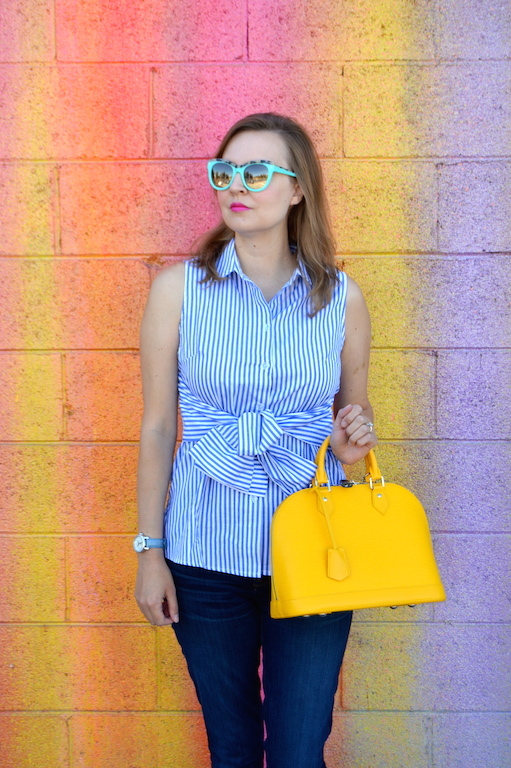 I have more menswear inspired long sleeve shirts than I can count, but this one from SheIn is unique insofar as it is short sleeved but has a tie around waist that looks like the sleeves of a shirt that you can tie into an adorable bow. Many of you have been inquiring about the fit from SheIn and this top, along with others I've purchased from the company is a medium. This shirt was just a little loose on me, but the fact that it ties around the waist allows for you to make it look a little more tailored. I usually have a lot of patterns on, but with this relatively simple outfit it was the perfect opportunity to try out some funky footwear. Last year I bought these Abstract Kitty flats from Charlotte Olympia and, to be honest, as much as I love them I don't wear them that often. This is actually a good thing because between the velvet fabric and the light color, they are an east target for getting soiled. I am glad, however, that I wore them today because they matched the wall perfectly! 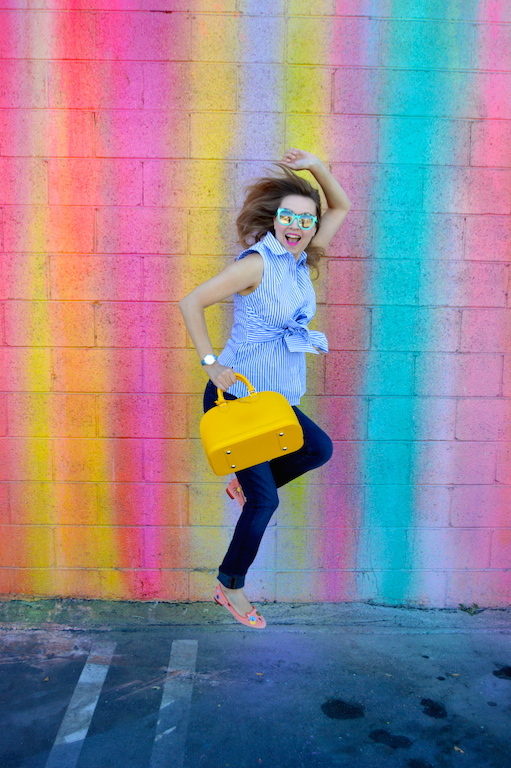 Bag: Louis Vuitton Alma in "Citron"
Oh...and after a lot of practice and a lot of epic fails, I think I finally perfected my "jump" shot. Practice makes perfect! That top is too cute! Love the bow and the vertical stripes! Love everything about this look and that wall is amazing! Beautiful! I love your signature style and wall arts. 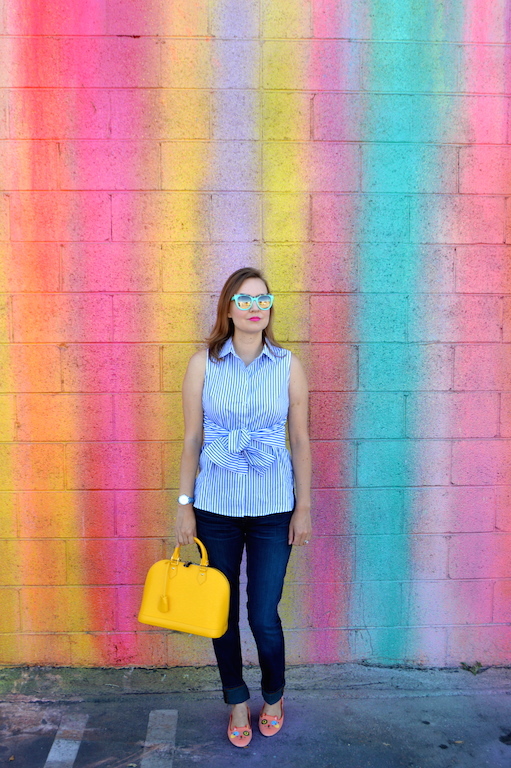 Splendid look and lovely colorful wall. 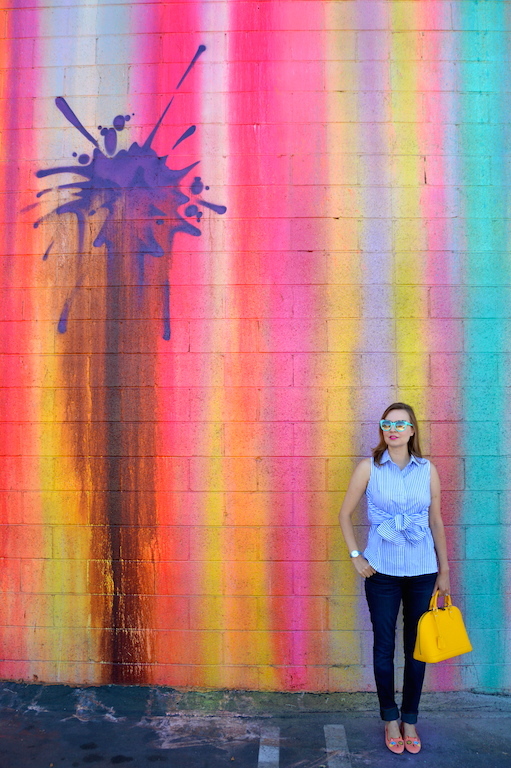 Katie, you do always find the coolest, most colorful walls! Love the bow on the shirt, a twist on a classic, and those fun shoes! This short looks fabulous on you. I really like how the tied sleeves accentuate your waistline and help tailor the top. Adorable kitty shoes. 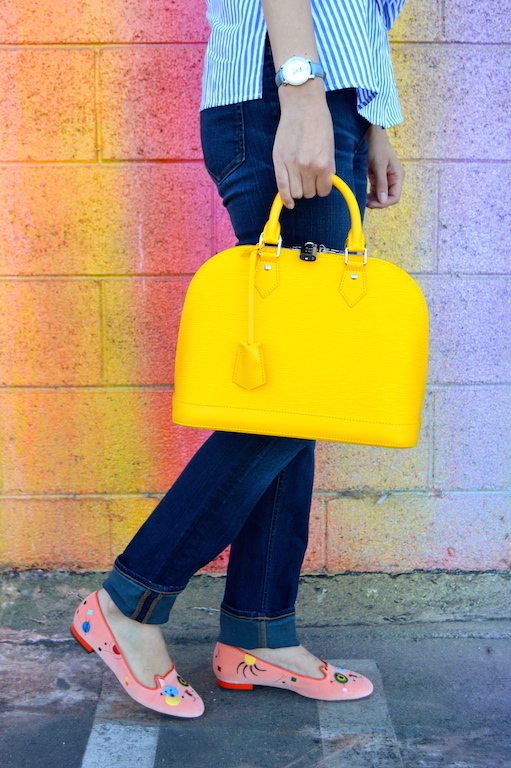 I just love finding similar fun and out of the ordinary shoes. Perfect jump shot! So darling---and that last picture made me laugh! In L-O-V-E with all the colors!!! 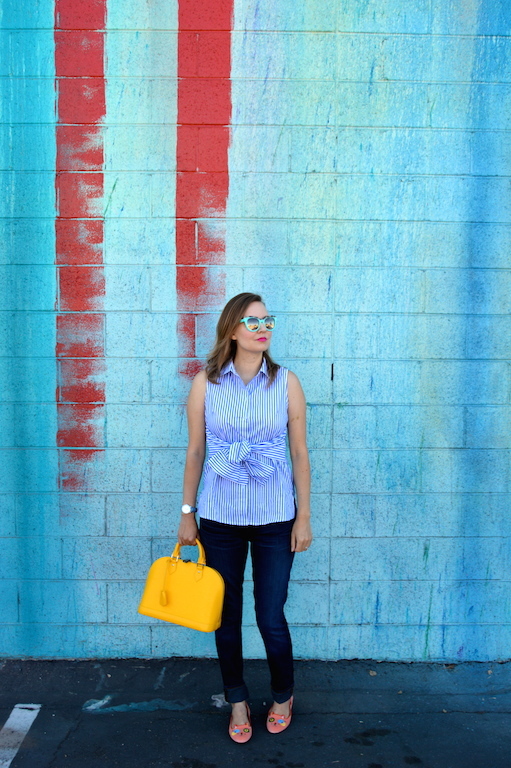 such an amazing backdrop and yet your purse still makes a pop! Found you from the link up. Such great pictures against that wall. My fav would be your jump shot!